Wish I was joking. But it turns out that Cambridge Analytica is the least of it. In between giving Facebook user data to companies that did psyops for hostile foreign powers – and how is that not an even bigger scandal? – they gave it or sold it to a few other people too. We’ve talked about Facebook’s leaky approach to device manufacturers. But they’ve also been delivering user data right into the hands of Russian Federation military intelligence. This isn’t just their usual easy scrapability, or even that they allowed Russian intelligence access to their normal API. They gave these guys a special data extension. Here’s the procedural, how-we-got-here bit. In 2014 Facebook introduced new rules governing its API, which previously had been used to harvest vast amounts of personal data for marketing, advertising, interfering in elections and matching Spotify playlists. But it left some entities as long as six months to become compliant with its new rules. Fairly innocent outfits like the dating app Hinge got a breather like this. So did Mail.ru. Mail.ru is kind of a mix between Yahoo! and Google. It’s Russia’s biggest internet business and 86% of Russians who use the web see mail.ru at least monthly. 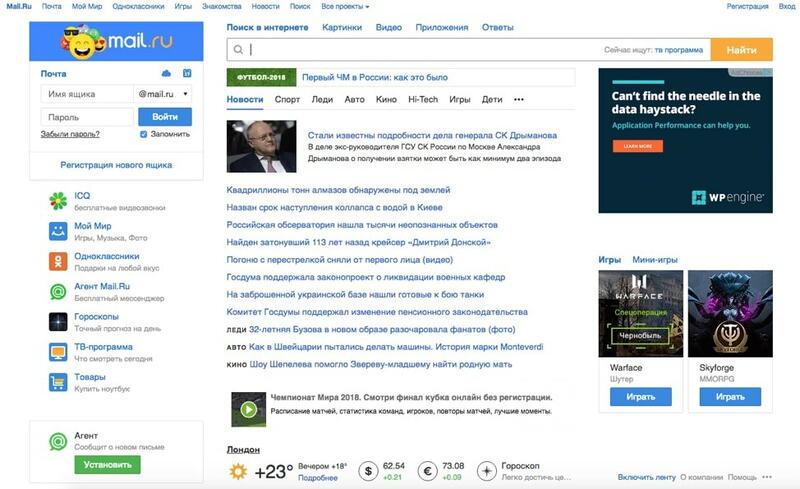 Mail.ru also owns the three biggest Russian-language social sites. In 700 pages of written responses to the House Energy and Commerce Committee, Facebook admitted that it gave Mail.ru a two-week extension to wind down a feature on two of its messaging apps that let users merge their contact lists between Mail.ru messengers and Facebook. From here, the plot thickens. Facebook and Mail.ru share a relationship with Yuri Milner, who invested heavily in facebook and founded Mail.ru. He divested from Facebook by 2012 and stepped down from Mail.ru some years ago – from the CEO position by 2010 and from the board in 2012. So far, so reasonable. A tech entrepreneur founds one business, invests in another. Stop the presses, hold the front page, tech guy does tech stuff. Thing is, Milner also has ties to the Kremlin. When the Paradise Papers were leaked in 2017, and tens of millions of documents detailing the financial arrangements of the rich, powerful and somewhat shady came to light it also emerged that Milner received hundreds of millions of dollars in Russian state funding, much of which he used to buy shares in Twitter, Facebook and other businesses through his international investment firm, DST Global. An investor investing is hardly the stuff of thrilling scoops either. To see it in context you have to understand the relationship between business and the state in Russia. Unlike in America, where business has more or less purchased the state in many ways – there are twenty paid lobbyists in Washington for every elected representative – in the Russian Federation, business and the state curl around each other; businesses that don’t obey state diktat go bust, while state sinecures attract large extracurricular incomes. And the demands of the Russian state always include some intelligence work. ‘If you are a Russian businessperson of a certain scale, you can’t escape the requirements Russian intelligence services are going to put on you,’ explains US diplomat Brett Bruen. At the very least, Facebook did a favor for an ex-investor’s old business – why did they grant mail.ru an extra two weeks? That’s pretty shady all by itself. But when we can reasonably assume that Vladimir Putin doesn’t give you a hundred million dollars to buy yourself something nice that goes with your eyes, what has Facebook really done? It looks more and more like they’ve given Russian intelligence a lot of help. You can’t get rid of swivel-eyed would-be dictators and sleazy businessmen for just a few dollars a month. But you can go some way to keeping yourself safe online, by getting a VPN – and using it!